9"x12" oil on panel. 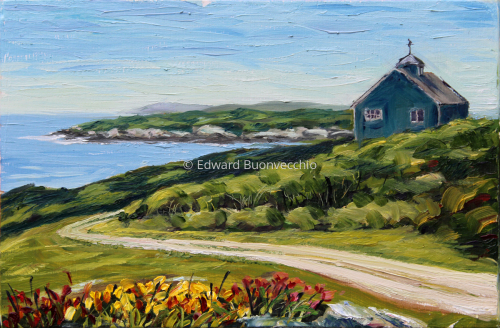 After painting the wondrous, rugged rocks along the shore of Ocean Point, I turned my easel to this evening view of a sun drenched house! 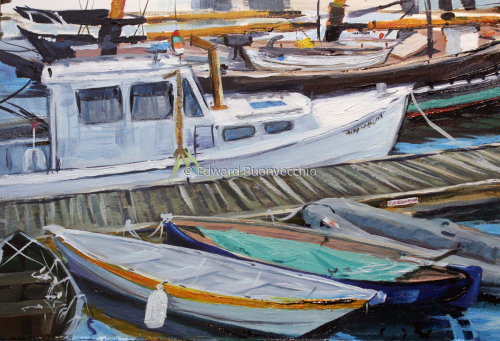 What I love about painting at the waterfront in Portland are the narrow inlets between the wharfs and the mass of working boats docked bow to stern. The color is vivid and the water wildly reflects it. A fisherman came up to me saying: "Paint this for posterity, in a few years all these boats will be gone, replaced with yachts". 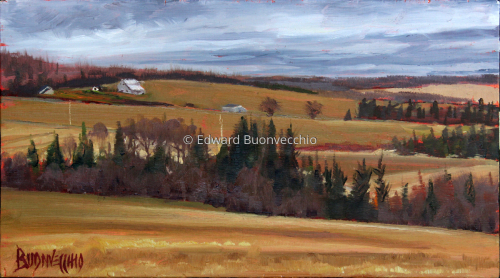 I loved the rolling fields, woodlots and distant farmhouses of this highland region of Aroostook County. 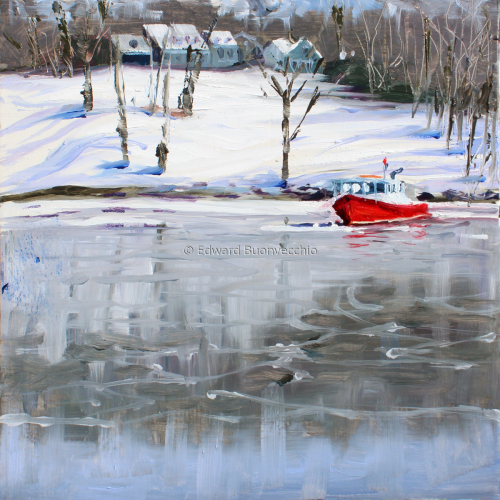 Early spring can be cold, windy and threatening in Maine as it was this Sunday morning in early April but I got lost in painting this scene. I was with my fellow Plain Air Painters of Maine following our opening reception at the Reed Gallery at the University of Maine Presque Isle. This Marina adjacent to the Royal River Grillhouse. This fall day was a busy place to watch the boats culled from the busy harbor. 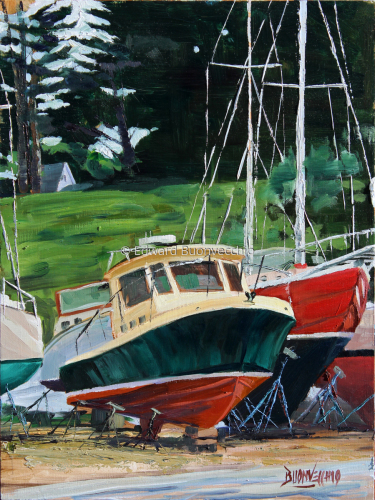 I had returned three times to finish this painting due to the incessant coming and going of vehicles tending to the boats put in dry-dock for the winter. 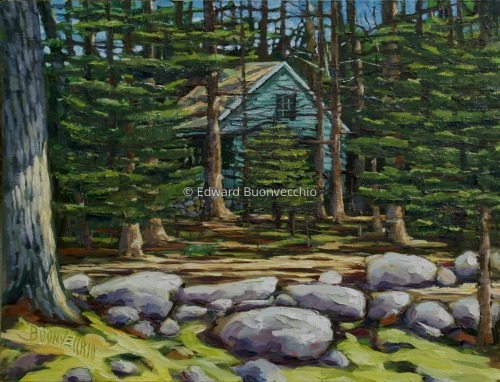 Oil on Boxed Panel, 8"x8"X1.5"
After taking many a ride around Schoodic Peninsula on the Loop Road stopping to paint, scramble over shoreline rocks or gawk at the sites, I always noticed this house built on the bank of Wonsqueak Harbor and I vowed to come back to paint it. 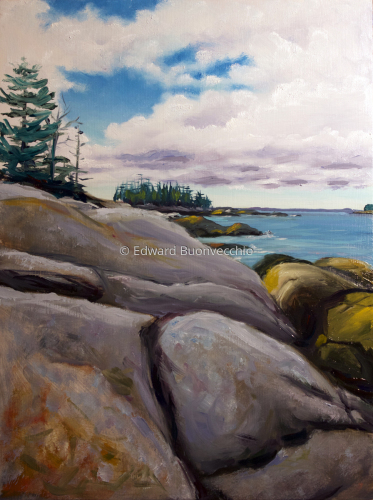 After picking up my paintings from a gallery closing for the season in Winter Harbor, I thought I would take a short ride around the Schoodic Peninsula to find a place to paint that afternoon. Lo and behold, I found a whole gaggle of painters to paint with, some of whom I already knew. 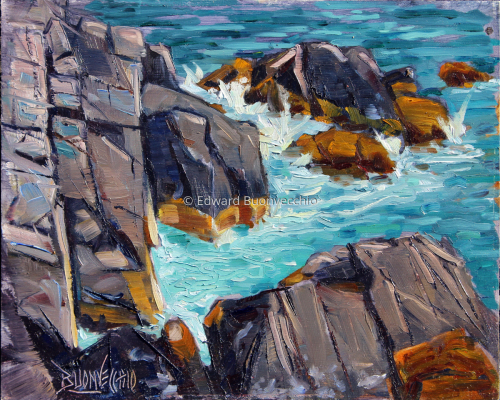 Most of them were with host Eric Rhoads (Plein Air Magazine) where A group of 98 painters gathered in October 2015 for PleinAir magazine’s first annual Fall Color Week publisher’s invitational event in Acadia National Park near Bar Harbor, Maine. Several of us lined up at the bridge over Mountain Brook on Schoodic Loop Road where we painted this evening scene! 8.5"x5.5" oil on panel. 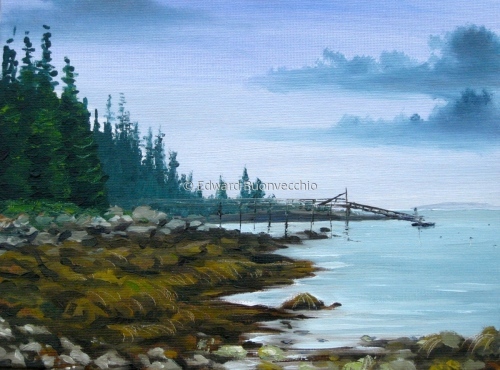 One summer morning in Bar Harbor, the fog was playing peekaboo with me. 8"x8"x1.5", Oil on cradled birch panel. On a cold but beautiful sunny afternoon in Camden Harbor, I was captivated by this little yellow dinghy bobbing like a cork. 8"x10", oil on panel. 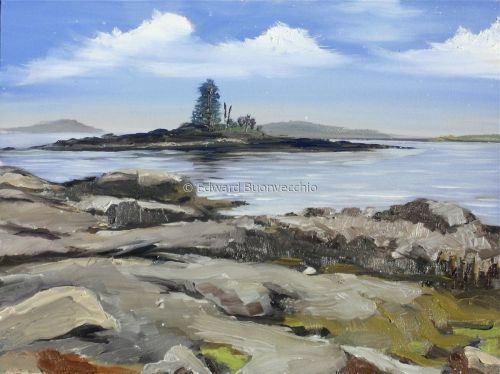 Today's painting at Moose Point State Park. I met Peter there as he was finishing up painting for the day. The oaks turn deep rust color this time of year! 11"x11" oil on panel. 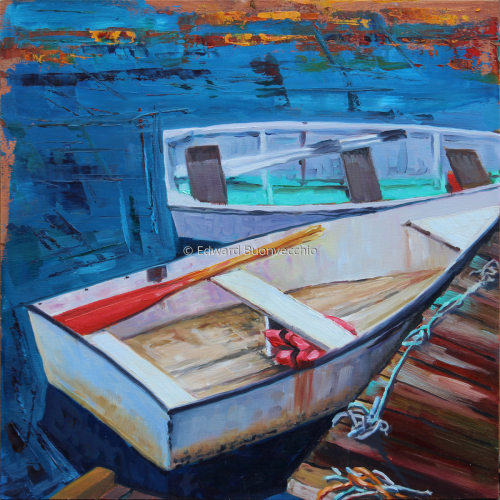 During a peaceful Sunday morning walk in Prospect Harbor, Maine, I found these little boats waiting to float their captains to the mooring. 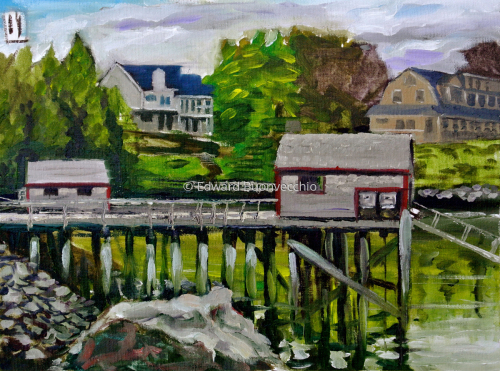 Oil on panel, 7"x9", During the Boothbay Harbor's Stroke of Art, we set up our easels on a working dock and starting to paint just before John, Andre and I were evicted by a fisherman who was not feeling very accommodating. 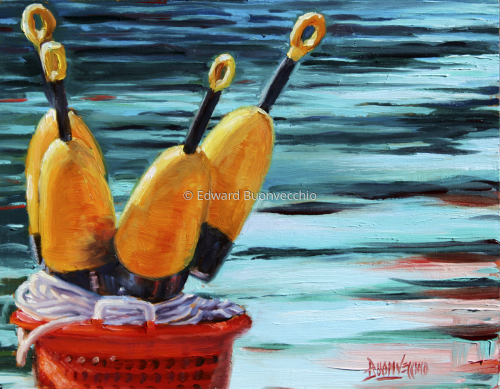 But I was able to shoot a few great views including this basket of buoys. 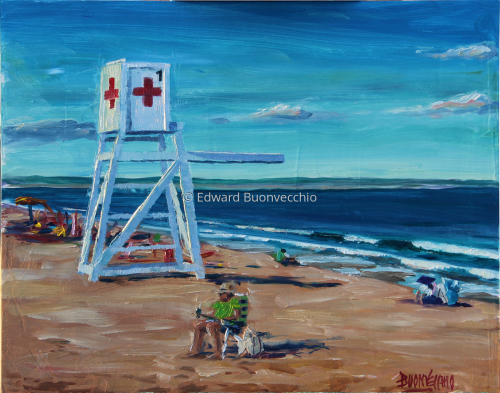 This painting on Ocean Park Beach won honorable mention during the Ocean Park Plein Air Festival in July of 2014. As I painted i loved how the shadows got longer and longer and more and more dramatic. This small historic oceanside family style summer community called "Chautauqua-by-the-Sea" is affiliated with the Free Will Baptists. 9"x!12" oil on canvas panel. 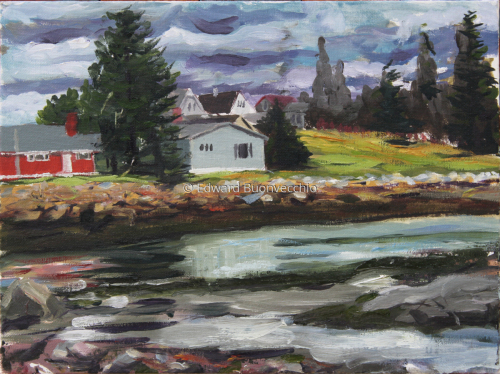 Painting with the Plein Air Painters of Maine at Ocean View, East Boothbay, Maine. This day I forgot paint, duh, and had to borrow from Corrine. 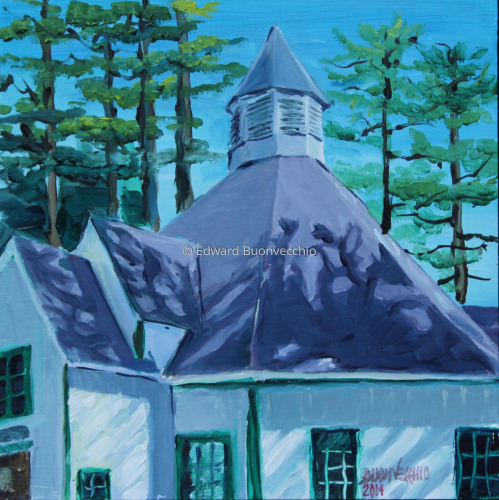 This was painted during the Ocean Park Plein Air Festival in July of 2014. 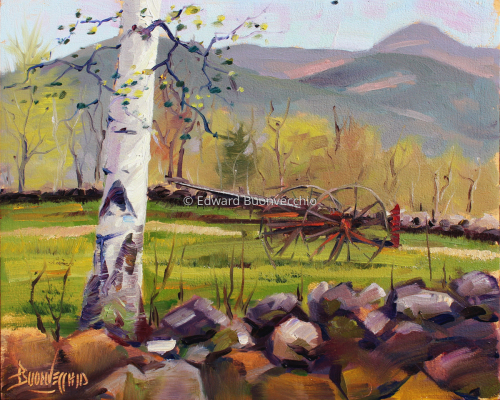 I positioned myself with my back to Goosefare Brook and was compelled to paint this composition by how it seemed the shadows glued these boulders together as one. This small historic oceanside family style summer community called "Chautauqua-by-the-Sea" is affiliated with the Free Will Baptists. 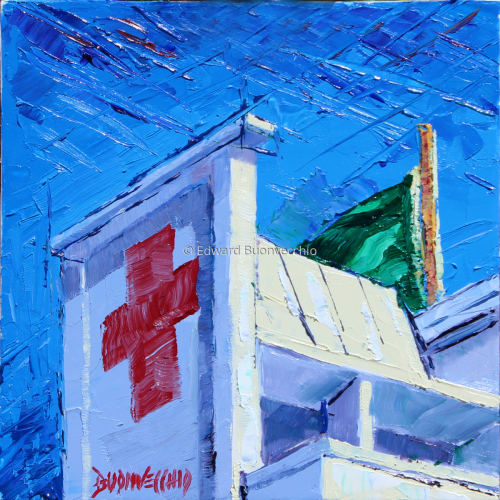 This was painted during the Ocean Park Plein Air Festival in July of 2014. This, deep, dark old-growth forest is the pride and joy of of this small historic oceanside family style summer community called "Chautauqua-by-the-Sea" and affiliated with the Free Will Baptists. The site is located on Temple Avenue on Saco Bay, Maine. 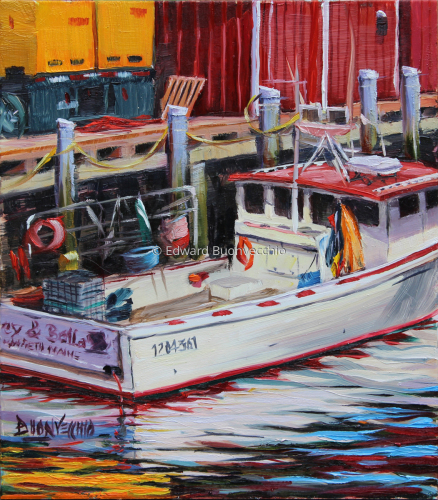 This painting was created during the second annual voyage to Fisherman's Island in Boothbay Harbor, Maine. 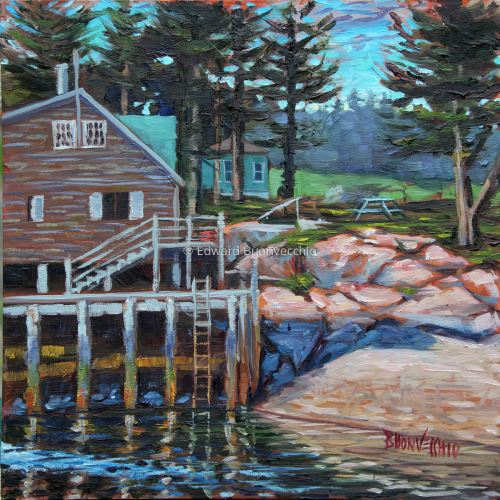 The island is privately owned by a couple who became acquainted with Corinne McIntyre, a fellow painter and part founder of the Plein Air Painters of Maine. Fifteen PAPME members were transported by boat to their island where we were treated like royalty with coffee, pastry and juices. 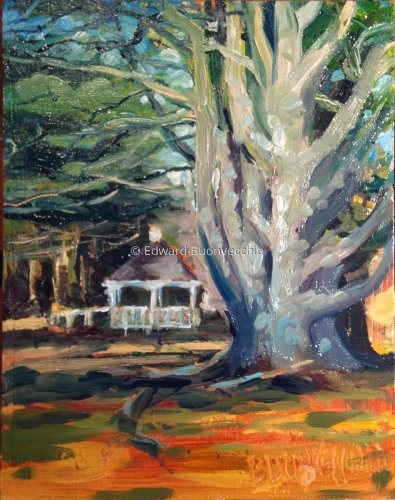 We then roamed the grounds of this beautiful estate and painted to our heart's content. Oil on panel, 9"x12". 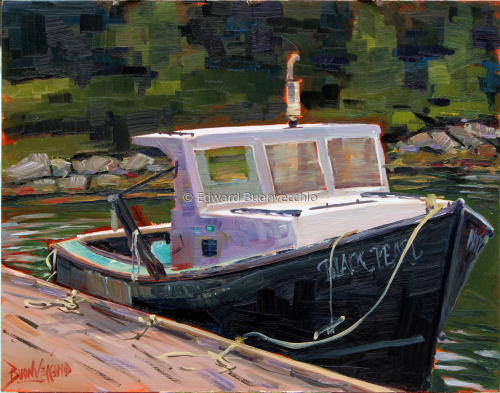 Every Wednesday morning the Boothbay chapter of the Plein Air Painters of Maine congregate at some appointed place in the Boothbay Region. This day we were positioned directly across from the village of Boothbay Harbor. Right in the middle of a walkway across the Harbor stands a little stately matchbox shanty which served as the focal point in the composition of the shapes, shadows and reflections. The pilings and bracings under the building and footbridge at low tide, made the whole bridge look like a centipede ready to walk away. It was kind of a cold spring morning in Rockport. I was set up in the perfect place to see the big boats being carefully lowered into the harbor for the summer. 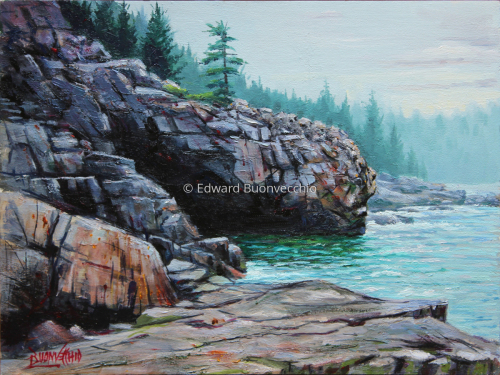 For this painting I was on site at Moose Point State Park, Searsport, Maine. It was cold and blustery especially in the field where I set up. As I was crossing the field I could see the composition of this stately tree and the white gazebo come together. The sunlight withered away and I decided to finish this work in the studio. This is still available as is or floated in a 3" cherry frame. 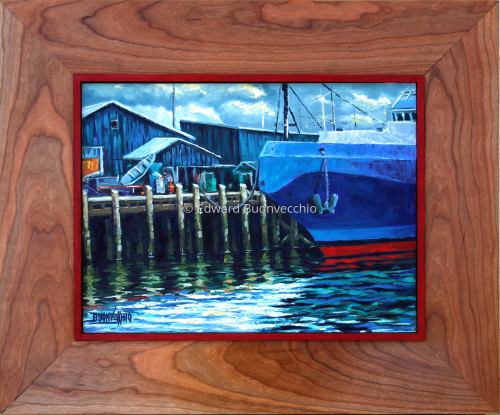 For a sample photo of the custom cherry frame see "Boston Tug" in my Seascapes and Landscapes Gallery. 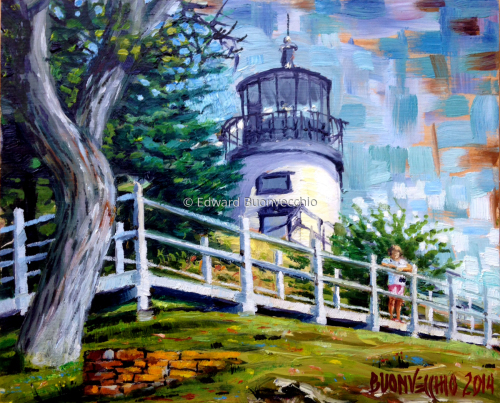 Wile painting this lighthouse a little girl named Miriam asked me to paint her in. I did and here is the result. Miriam's father bought it. This is my fifth painting for 30 Paintings in 30 Days. Oil on panel, 9"x12". My wife was in Stonington, Maine for a business meeting. I went along to explore our new state after moving from Arizona. This is such a beautiful part of ME. I found myself at Sand Beach and snapped a picture that I thought would make a good painting. This is it! Oil on watercolor paper, 11"x 7". 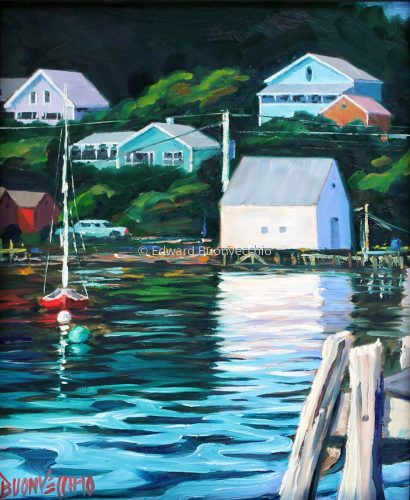 This is a studio painting from a photograph I shot while scouting places to paint for the Ocean Park Plein Air Festival. 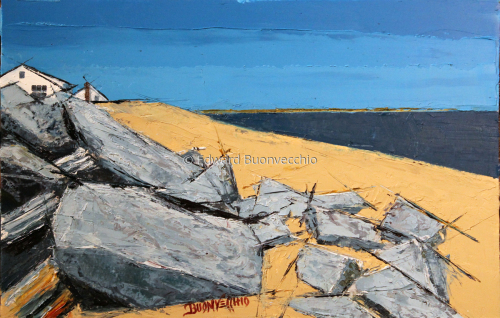 using a palette knife I wanted to emphasize the texture and how the angles of the roofs, rocks, sand and water all relate to each other. I really like how the white cottage peaks peek over the dunes. Oil on watercolor paper, 11"x 7.5". 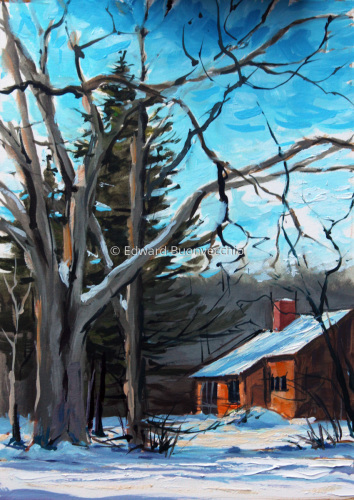 I was out painting this afternoon in springlike weather at 44 degrees. Camden harbor was like a bedroom for boats. Some big yachts were in their huge white sleeping bags for the winter but some were still out, working and playing throughout the winter. 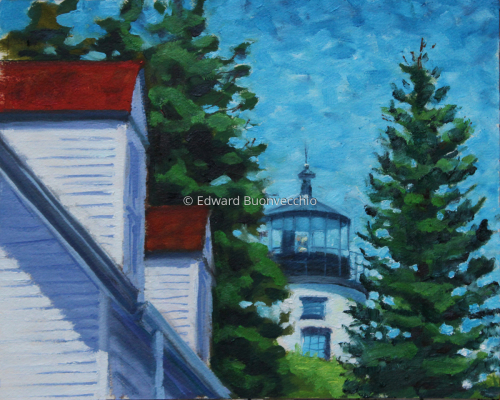 Here is a studio painting of Owls Head Light. 8"x10" oil on Arches watercolor paper. Oil on panel, 11"x14". On the shores of Sebago Lake sits Migis Lodge, a beautiful setting for these rustic but luxurious cabins. 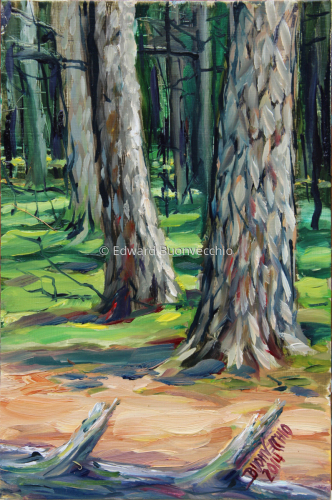 I did a painting earlier in the morning of the lake, but for my next painting I did a 180 and was struck by Whippoorwill Cabin peeking out through the dark pine forest with the sun glinting off its roof and forest floor. Oil on panel, unframed 9"x12", framed 17.75" x 14.75". This is the Maine Responder docked at Union Wharf in Portland Harbor, a pollution control vessel that was enlisted to help with the clean-up of the Deepwater Horizon spill in 2010. 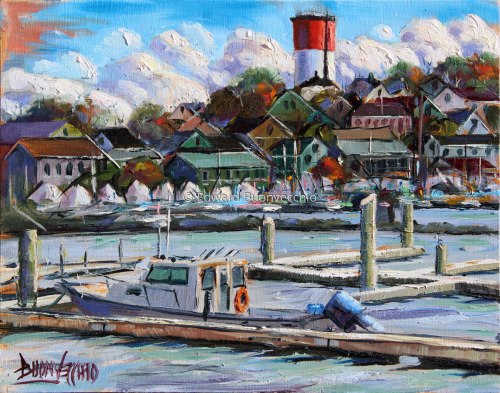 I was painting on Merrill's Wharf on a busy, overcast day with the pungent smell of herring, fishermen unloading their catch of herring with huge vacuum machines, boats motoring, workers swabbing, tackle cluttering, all contrasting with a slick blue and white ship waiting like a Swiss Guard for the next environmental threat. 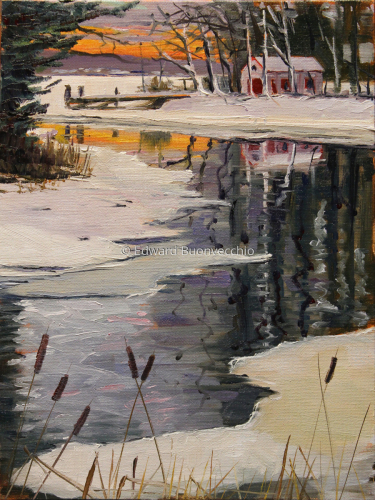 Fisherman's Island Cottage, 8"x18" oil on stretched canvas. 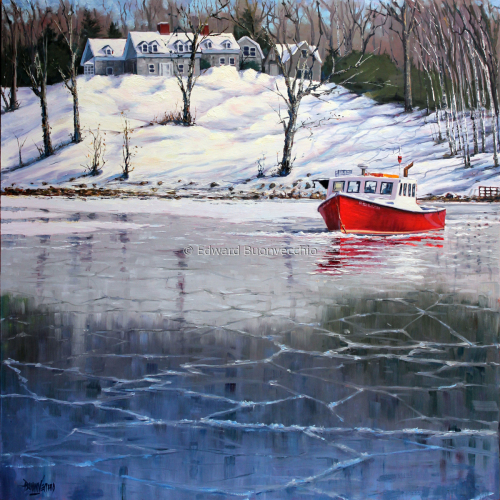 Susan and George graciously agreed to let PAPME paint on their beautiful island off Boothbay Harbor. This was painted on site with a little touch-up in the studio. Eight of us were picked up and boated to the Island yesterday morning and treated to coffee and donuts before we were let loose on the grounds. This our third year there and look forward to next year if they will have us. 8x10 Oil on panel. 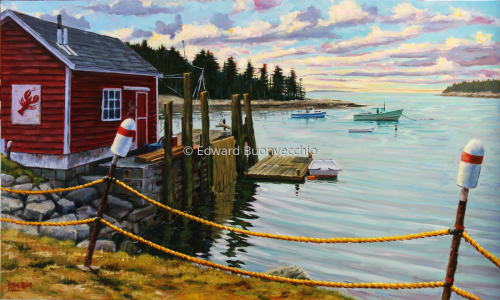 A morning painting in Stonington. I could spend many days here painting everything! The low morning sun made everything pop! Sold! 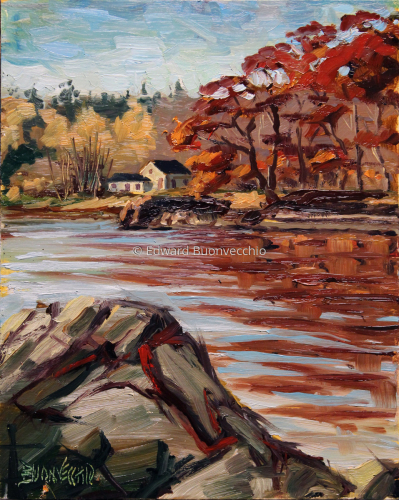 This 12x16 oil on birch panel was painted on a warm October morning in Winthrop, MA. It was an amazing 70 degrees! I will bet some of you recognize this iconic water tower as you approach Logan International from the air. 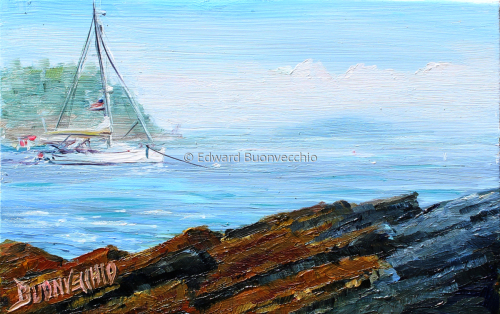 The next day I painted the Boston cityscape from East Boston Shipyard! 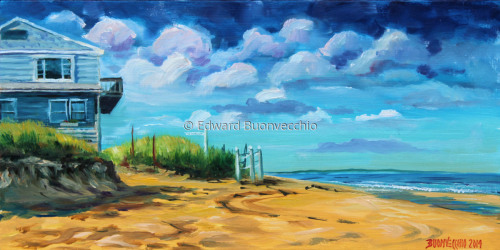 Painted with palette knife and brushes, this painting was done onsite on the beach during the 2nd annual Ocean Park Plein Air Festival. The late afternoon sun was warm and cast a yellow sheen on the chair. The sand was warm and soft between my toes and I was struck by the empty white chair against the cloudless blue sky. 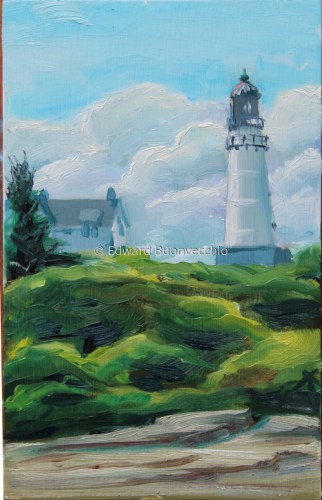 Oil on panel, 8"x10", My first ever painting of Portland Head Light. I was captured by this view. I love what a little titanium white does to mixed phthalo blue and green for the ocean water of Maine. 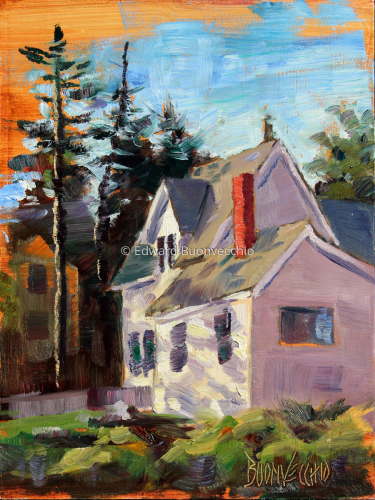 This the first time painting with the Plein Air Painters of Maine after moving to Maine from Arizona. 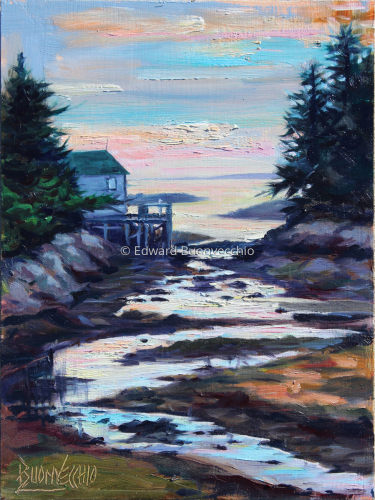 I started painting with the water at low tide but by the time I was done the water was lapping at my feet. It was wet with no sun that day which gave the earth and air a rich humid smell and saturated earthy color. 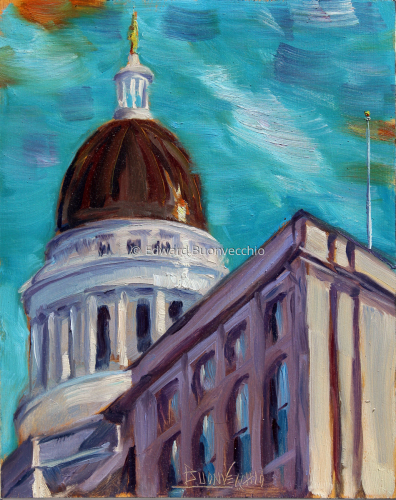 My second painting in the 30 Paintings in 30 Days challenge. 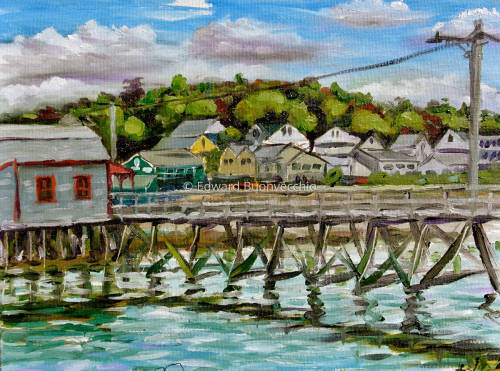 This is from a photo in the harbor of Castine Maine. 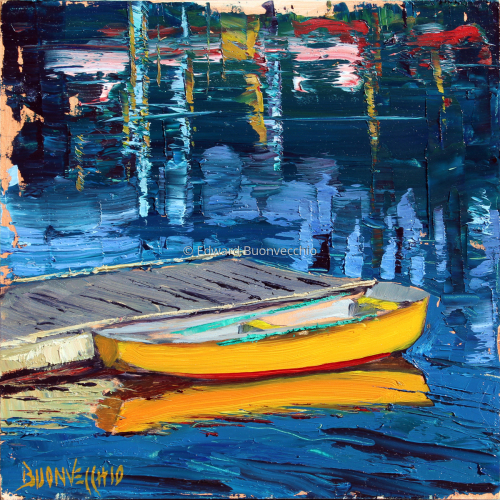 I am always mesmerized by boats bobbing in the water like corks and the incredible shapes and colors the waves create in their reflections. 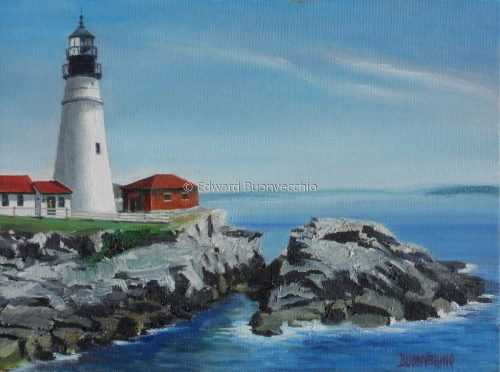 I did two painting this day at Two Lights State Park on Cape Elizabeth, Maine. The first one took 2.5 hours and I gave up frustrated. I had another panel so I turned my easel 45 degrees north to this view. but I only had another 1.5 hours...sometimes the best stuff comes when under pressure. I just finished this painting in the studio. A couple days ago I ran across a picture on fb from a friend, Amy who shot this great picture at a marina. It was stunning and I thought it would make a great painting. 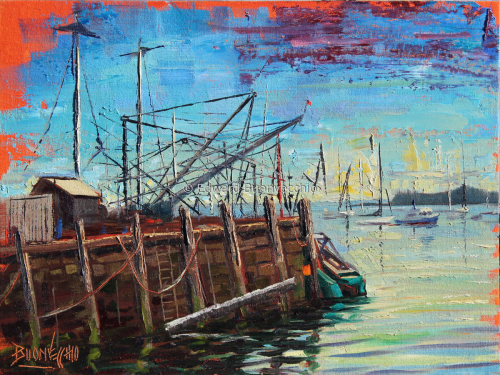 This was painted during the Ocean Park Plein Air Festival in July of 2014. One of the prominent buildings of Ocean Park is the Free Baptist Tabernacle Temple, a large meeting hall serving as the central gathering place of the camp. The style was similar to other prominent summer church "camp" revivals such those at Ocean Grove, New Jersey and Wesleyan Grove on Martha's Vineyard. I was struck by the shadows of the trees on the roof and their green silhouette against the sky. This small historic oceanside family style summer community called "Chautauqua-by-the-Sea" is affiliated with the Free Will Baptists. The site is located on Temple Avenue on Saco Bay, Maine. 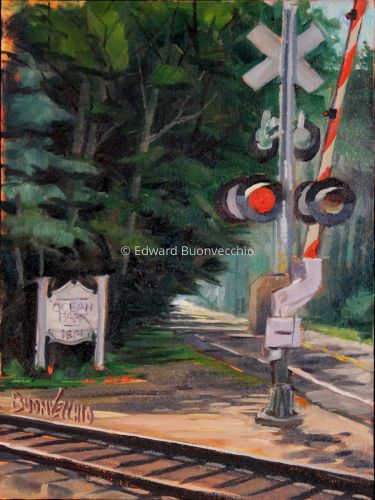 When you cross these tracks you know you are in Chautauqua-by -the Sea! Ocean park is a Chautauqua community full of families who have had cottages here for generations since 1881! Ocean Park has one of the best beaches in Maine. During the Ocean Park Plein Air Festival I found this beach house located on the Goosefare tributary that borders the Rachel Carson Nature Preserve. 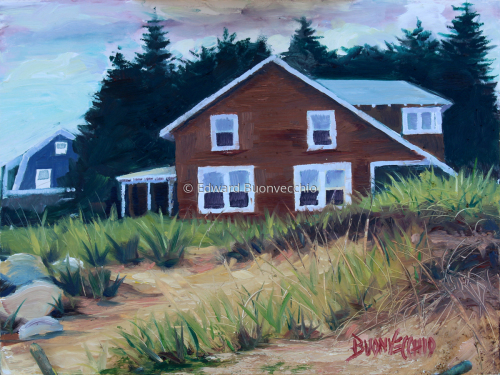 It was late in the day and I loved how the house was framed by the dune grass and the silhouetted pines. During a short trip to New Orleans, I was struck by this angle made dramatic by the sun skimming the surface of this iconic cathedral. On the lawn of the Ocean Park Library I found this view around the corner!I liked how the dark green trees framed this house! 9"x9" oil on cradled birch panel. 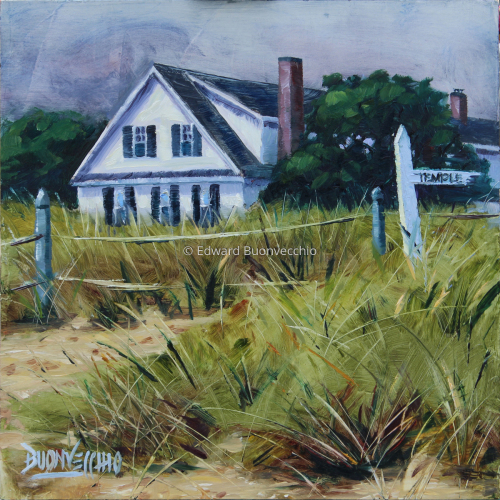 During the 2015 Ocean Park Plein Air Festival, I never tired of the the dunes, beach houses, the sand between my toes and the ocean breezes. 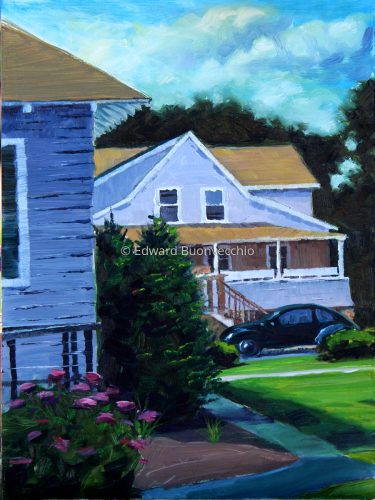 This made for an awesome painting experience, especially when my eyes fell upon this house behind this grassy dune. I will never forget the woman who bought this painting at the show at the Temple. She spent her summers here since she was a little girl and showed me how much she appreciated this painting through her tears. 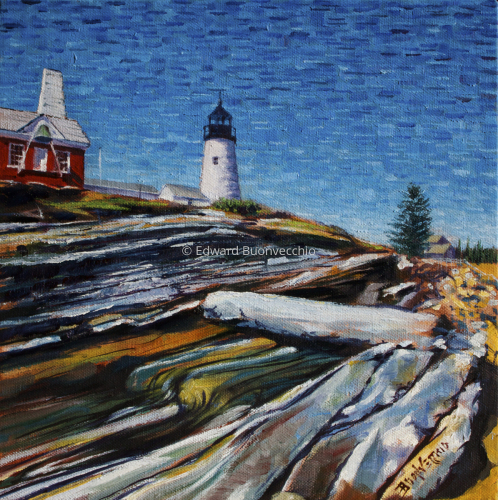 Whenever I visit Pemaquid Light I am captured by the swirling form and myriad of color in the rock. Fall colors in Maine are incredible! 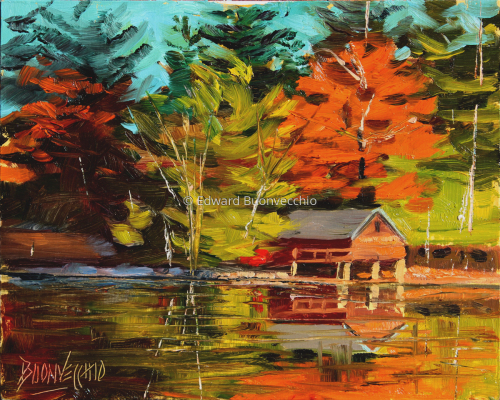 I could not pass by this scene without painting this wild riot of color! A blustery and balmy morning on Ocean Point at Grimes Cove. 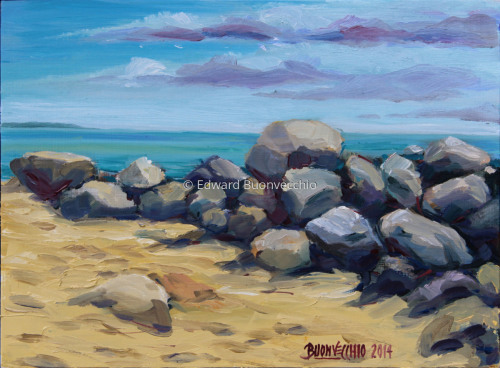 In July of 2015, during the Ocean Park Plein Air festival, I was drawn to the beach like flies on cowpies. Toward sunset the lifeguard chair got more and more striking with the yellow-white sunlight against the blue-green sky and the long shadows. But, as I was painting, a lone woman plunked herself down right in front of me reading a book. I took a step out of my comfort zone and dabbed her in. A little while later a whole group of women joined her in a circle. They all came over to see their painted-in comrade, ooooed and ahhhhed and told me they were a book club having their meeting. I found this quaint bed and breakfast and farm estate one morning along Sunday River in Maine called Mountain House. 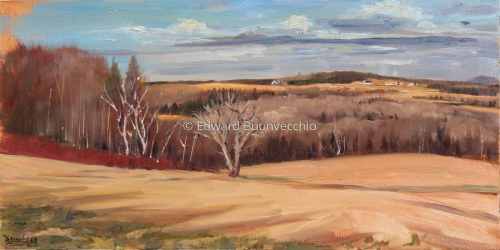 It was cold but invigorating painting under a beautiful late fall sky! 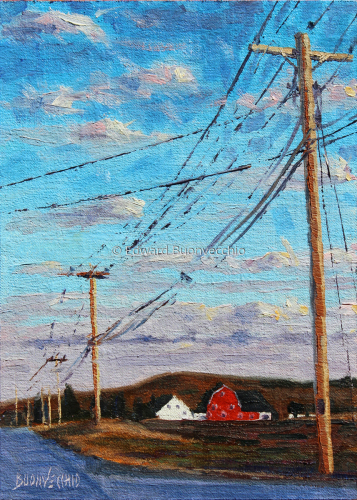 The potato fields of Aroostook County of Maine, lay dormant in early fall but the their red barns and white farmhouses stand proud in the starkness of early spring. An amazingly clear fall day this was on the causeway at the southern end of Cobosseecontee Lake! 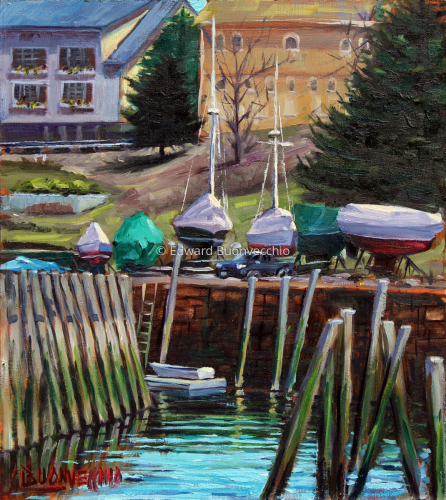 It is always a pleasure painting at the harbor in Rockport, Maine! 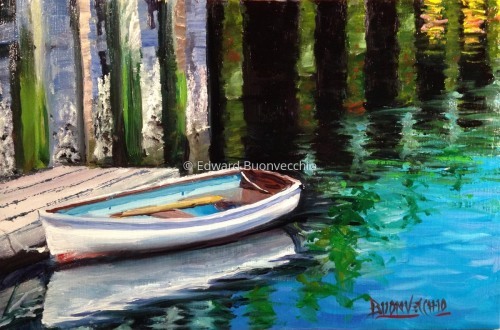 Anywhere you look you can find a great composition and early spring affords us painters a unique opportunity to paint the still shrouded boats before their mad dash for the water! Aroostook County in Maine is known for potato farming. The old potato storage barns are unique in construction and the fields are brilliant with blooms from potato plants several weeks after planting. However I found a different kind of beauty in the rolling, stark, barren fields before planting. A week with friends on Monhegan would give me and my wife a much needed respite at least that was what we thought! My wife, Julie had to go back to the mainland for business and I was hindered with a wounded knee! There was no electricity, no cars, flushing of toilet paper was not allowed and we had to hike and walk everywhere! In spite of these "terrible" hardships, I am going back! Our friends are closer than ever before, we prepared the best meals, the hiking and sights were breathtaking and painting opportunities were dramatic and beautiful and sometimes dangerous. It was a cold winter day but you would never know it! The Maine State House dome stands proud with new copper cladding! 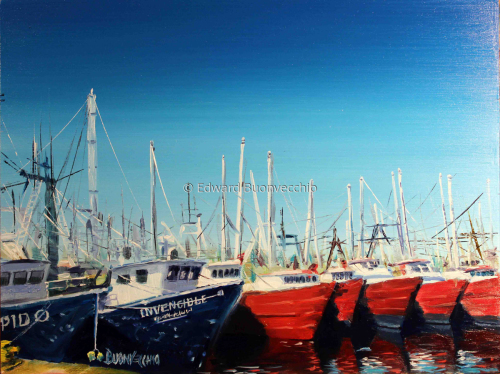 On a sweltering hot day at Landings Marina in Rockland Harbor, I was drawn to paint this great jumble of masts, cranes and hoisting tackle! 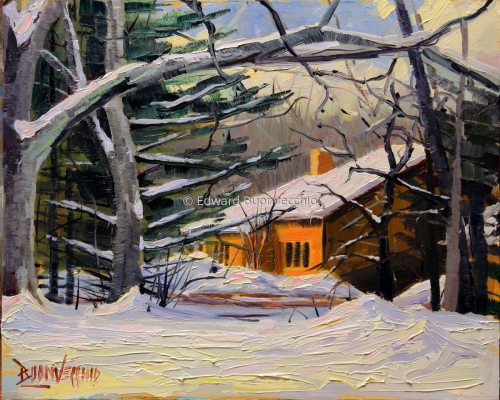 Painted on New Years Day after our biggest snowfall so far this season, I could not pass up trying to capture the late afternoon sun striking our neighbor's house! 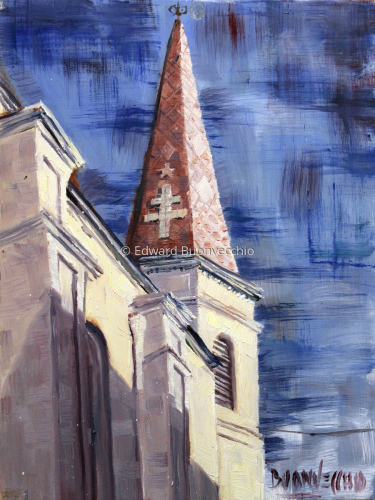 Day 4 of the Strada 31 Day Challenge painting from life! 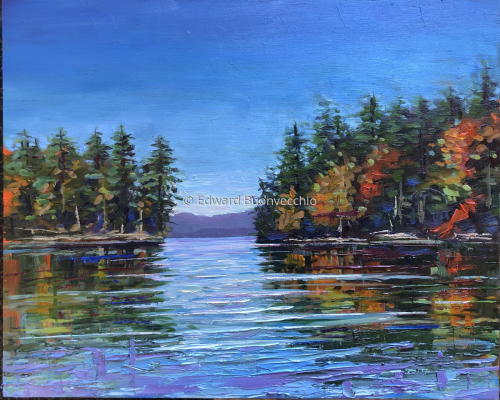 The Cobboseecontee Lake is a few miles from our house in Manchester, Maine. 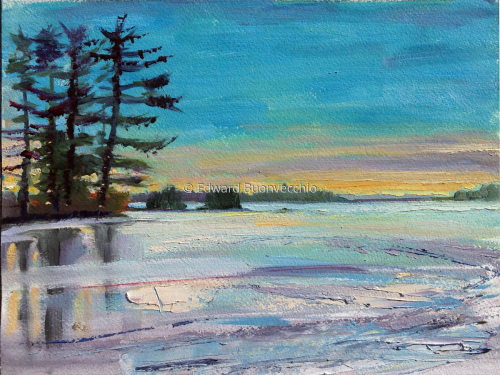 I've painted from this spot at the Northern end three times! 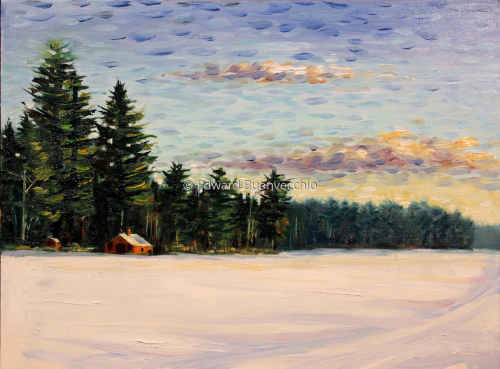 It is a beautiful spot to paint from Winter, Spring, Summer or Fall! While in Winter Harbor in late winter, I found a great spot on a rocky beach across from Prospect Harbor Lighthouse and the United States Navy satellite operations station. 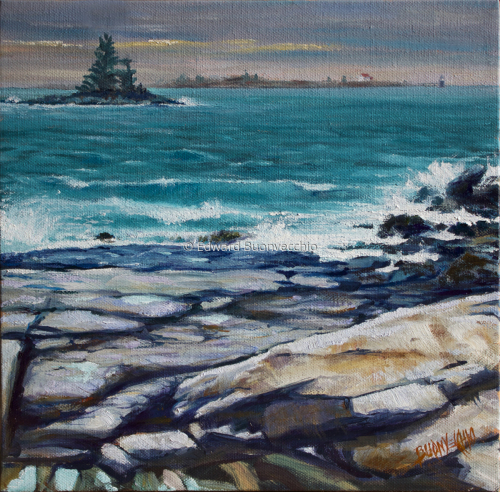 I painted this gorgeous scene on a wet and windy morning before an approaching Nor'easter lashed the coast of Maine that night with wind, rain and sleet. A recently restored canoe cast an invisible shadow blocking out the sky reflection on the water. It allowing me to see the shallow bottom of the lake and little fish swimming by. I was wondering if I would also see a Loon flying underwater in hot pursuit! 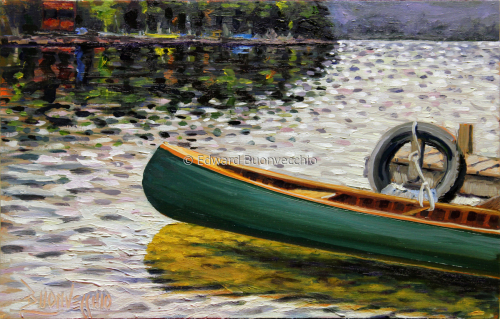 I painted this old sleek canoe on Salmon Lake at Wheeler Camps in the Belgrade Lakes region of Maine. On a threatening and misty day in Acadia National Park, I stopped at Schooner Head Overlook and hiked down the trail to the rocks below. From the trail, one would not have known the cave exists until you climb down on the rocky shelf below. 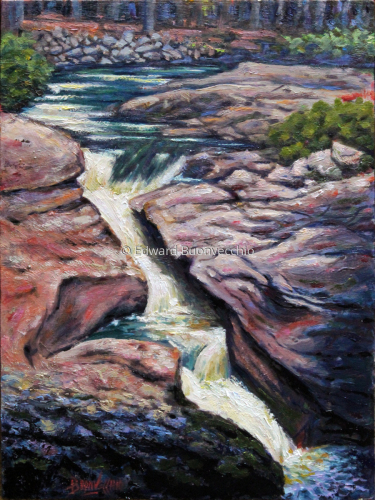 I found a perfect vantage point and before I was finished painting, the water was lapping at my feet! At low tide the cave is accessible, but entry is discouraged due to the delicate wildlife environment and the endangered anemone that exist there! 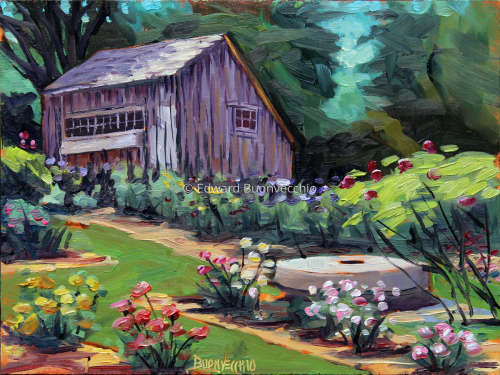 On a Springtime trip to the Berkshire Mountains in Massachusetts, I spent a sunny morning painting in the Berkshire Botanical Gardens rose garden. That morning was spent with about a dozen mostly volunteer gardeners fluffing the turf and roses. As I was scouting the grounds, I found a really nice vantage point when this old weathered shed and the footpath meandering between the roses lined up to create this composition. 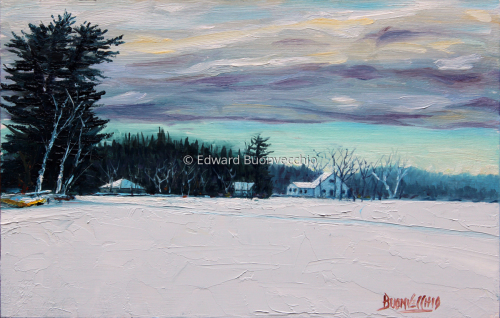 Bruce and I met one brisk April morning at Vaughn Woods in Hallowell, Maine. The air was cold and the snow was spotty on the ground. Ice was crusted around the edges of the brook. At times the sun shone through the thin cloud cover and steeped the old stone bridge and surrounding forest floor in a warm glow. 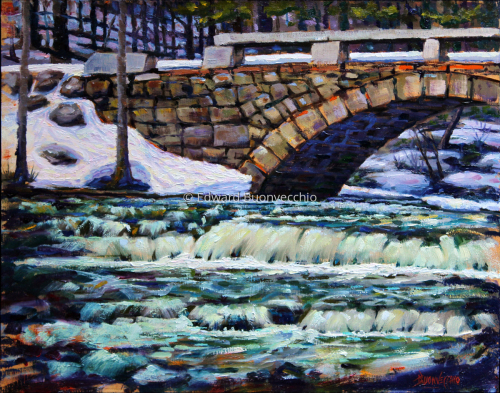 I met my new painting buddy, Bill last summer at beautiful Snow Falls along the Little Androscoggin River in West Paris, Maine. I found a nice composition among this dramatic flume of water-carved granite. This site is steeped in the history of native and colonial peoples, as well as the site of an historic old stone mill! On the last day of the Fingerlakes Plein Air Festival I made an early morning hike to this creek toward the southeast end of Canandaigua Lake that has been cutting through the deep shale bedrock for centuries. 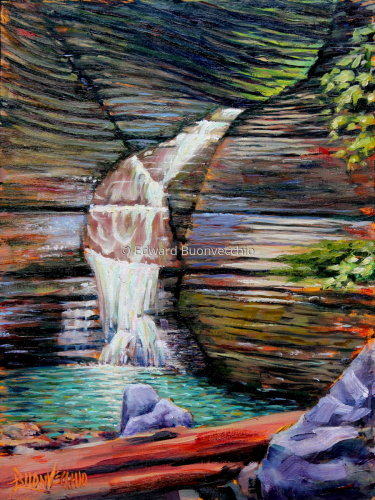 The result is a tranquil set of waterfalls that is a classic Fingerlakes scene that is poetry to the eyes. Seneca folklore tells the story of how the world began in Clark Gully. This is a special place. 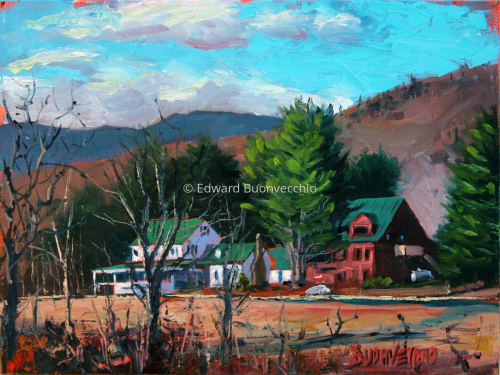 This painting was done on site at White Gate Farm in Tamworth, New Hampshire, on a glorious spring day during Wet Paint Tamworth 2018. Thanks go to owners Heather and Hank to allow us to paint there and for purchasing this painting. 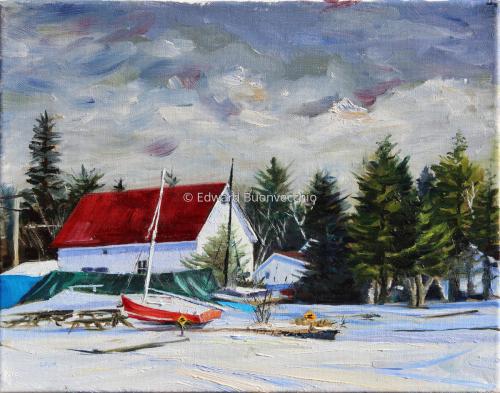 One of those fun times this past summer painting at Cozy Harbor with the Plein Air Painters of Maine. 11x14, oil on panel!